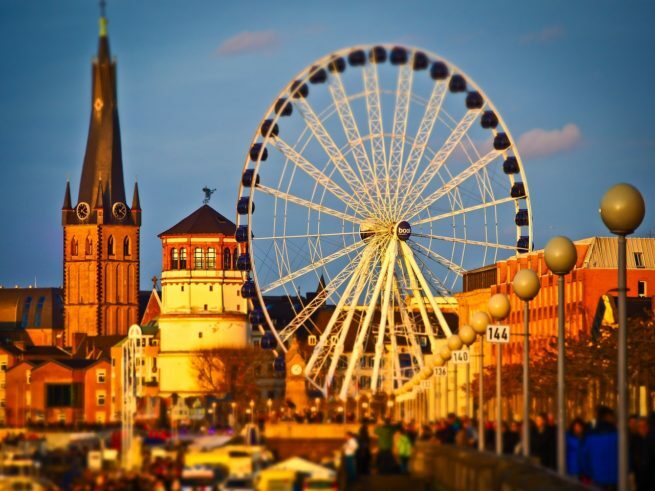 Book your private flight to the Dusseldorf, the capital of North Rhine-Westphalia. Whether you’ve hiring a private jet to spend time in one of Germany’s wealthiest cities or for business meetings in the area, we have access to thousands of Wyvern-certified private aircraft and can arrange the perfect aircraft and flight itinerary for your trip. Jet Charter Europe believes in providing private flyers with a one-on-one consultative service experience that exceeds every expectation. We understand that your time, privacy, flight preferences and most of all, safety, are all extremely important. Our private jet charter representatives are available for you by phone and email 24 hours a day, 7 days a week. When using our private aviation service, you can expect quick response times and an easy, hassle-free booking process. Request a quote or call us today and arrange your private charter flight to Dusseldorf, Germany. Dusseldorf is a city in western Germany and capital of the German federal state of North Rhine-Westphalia. Divided by the Rhine River, the city’s Old Town lies on the east bank, while the modern, commercial areas are to the west. There are many hotel options available for luxury vacations, getaways, business trips, and special events when staying in the area. We’ve put together a list of luxury hotels based on many factors, including Jet Charter Europe passenger feedback, location, amenities, and online reviews. Once arriving in Germany via luxury private jet, our Dusseldorf Jet Charter service brokers can also arrange ground transportation to/from the hotel of your choice. The bustling, modern city of Dusseldorf is also one of the wealthiest cities in Germany, with elegant shops, exclusive hotels and fine dining – especially along the famous boulevard “Königsallee“; Düsseldorf’s most elegant shopping street, it is affectionately known to locals as the “Kö.” Private jet charter travelers will find more places of interest along the Medienhafen (media harbour), a redeveloped harbor area with an array of international, avant-garde architecture. 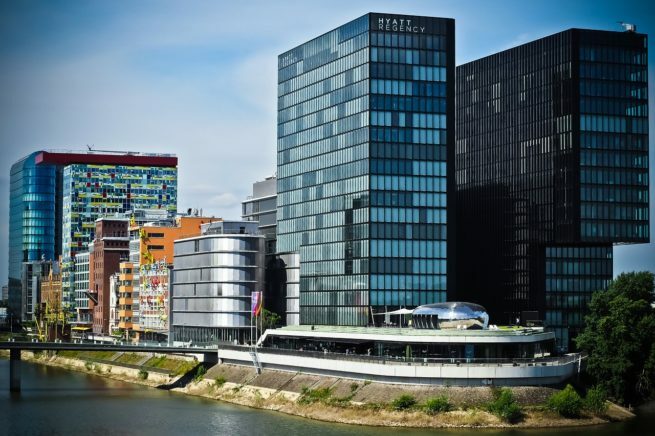 Dusseldorf is also a trade fair hotspot, holding some of the world’s largest trade fairs from the fashion, water sports and yachting industries, to the print and paper trades. The Rhine Tower (Rheinturm) is an observation deck & revolving restaurant atop a futuristic telecommunications tower, providing spectacular views of the city from 716 feet above ground. Dusseldorf’s ‘Old Town’ features St. Lambertus Church and Castle Tower, both dating back to the 13th century, and the “Altstadt” lays claim to the ‘longest bar in the world’. There’s also a number of old traditions held in the area – Carnival is celebrated annually, and Christmas is celebrated with a traditional Christmas market in the Altstadt. The city is also home to “Largest Fair on the Rhine”, one of Germany’s largest fairs drawing more than 4 million visitors annually. Check out more of our recommendations for luxury private jet travelers staying in Dusseldorf, Germany. Jet Charter Europe utilizes the following airport to fly clients privately to/from Dusseldorf, Germany and neighboring areas. Request a Quote or give us a call at 1-888-987-5387 to speak with one of our Dusseldorf Private Jet Charter service brokers for your next luxury vacation, business trip, or special event.